Hayley, who is in her mid-50s, helped people to get into work, before her multiple sclerosis (MS) diagnosis in 2009 stopped her from being able to work herself. After working all of her life, Hayley had to give it up as she couldn’t stand or talk for the duration of a class. She describes the impact MS has had on her as “a really cruel existence”, particularly because “it gets worse and worse and worse, unless you do something about it yourself." Hayley decided to do something about it and applied for a grant for a mobility scooter from the MS Society, who referred Hayley to the Turn2us Response Fund for a further grant to fund gym membership. 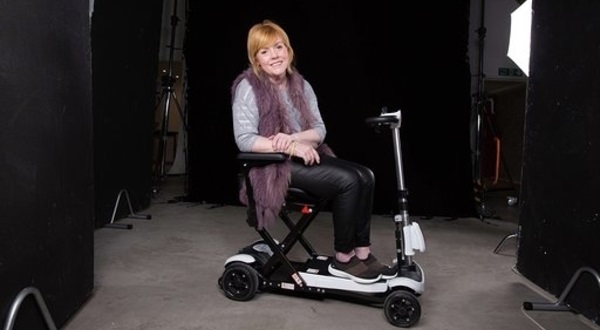 “The scooter was no good if I didn’t have membership to a gym, because the whole point of my operation, as I see it, was to get me out of the flat. I live alone. I don’t have children. I often get lonely, and I needed to be part of society." Hayley was awarded £1,000 for specialist gym membership – the grant should cover membership for four years. The gym has an assisted toning suite and a disability-friendly swimming pool that you can walk into, where Hayley takes part in low impact aerobics. Being active and mobile is very important to Hayley. It gives her life purpose. “What Turn2us has done for me has taken me from being stuck in my flat everyday on my own, to out of the flat, socialising and has enabled me to be part of groups." “It’s not just about me getting out and having a chit chat here and there. I'm better for it and feel happier in myself." “Since receiving the grant I’ve had the ability to have this structure in my life, it has made me feel a lot more positive and it’s given me back a little bit of my confidence." "I liked who I was, I liked my life, I like everything I did, and all of a sudden I had this person living with me who I don’t like. Well, I didn’t like, and I just wanted out. I just couldn’t see any future for me." Exercise can really help to manage MS and can slow any deterioration so the gym membership has been immensely beneficial to Hayley. She has become a real promoter for the cause and has persuaded many of the people with MS she knows to take part in the gyms' classes. The positive effect this has had on Hayley's life has enabled her to take part in campaigning work for the MS Society, including a photoshoot in London. She said: “It has given me so many opportunities." Reflecting on the campaigning activity she has done, Hayley says she “can’t believe I did that” and that the grant “has enabled me to turn the corner." Listening to Hayley, it is impossible not to be affected by her positivity and inspired by her drive. You could describe her as a new person since she has started her exercise classes but it would be more true to say that she has got the real Hayley back. Use the Grants Search to find out if you are eligible for a grant.